Some of the new wall covering. The Schuyler Mansion Twitter stream and blog have more photos. 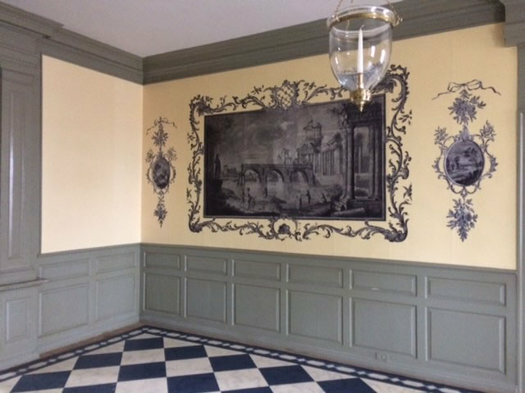 The Schuyler Mansion recently completed the reproduction and reinstallation 18th century wallpaper -- "Ruins of Rome" -- and the historic site's blog shares the details about how exactly that all happened. The process involved digital image tech and, we suspect, a lot of patience. Rather than the sparse interior which has greeted visitors for 100 years, walking into the mansion is like now like stepping back in time. Philip Schuyler vision for his home was calculated. Each element was designed not only to impress guests once they arrived at the home, but to encourage wealthy and important guests to come in the first place; thereby creating networking opportunities for the Schuyler family. The size and grandeur of the home was successful - drawing visitors like the Washingtons, the Marquis de Lafayette, the Marquis de Chastellux, Benedict Arnold, and even Benjamin Franklin, who had a letter of introduction written so that he could stay at Schuyler's when travelling through Albany. The "Ruins of Rome" helps historians and museum visitors alike understand the first impression that accomplished this. The Schuler Mansion is again offering its popular "When Hamilton Called Albany Home" tour in March. It's currently taking reservations for March 2 and March 4. And when March starts, it'll be begin taking reservations for other dates during the month. And if you go, be sure to scope out all the wallpaper. + "You maintain your empire in spite of all my efforts..."